Ubisoft's latest foray into the slightly mad series of Far Cry takes a turn for the apocalyptic with Far Cry New Dawn, and it turns out that can make some characters a little nostalgic. A lady by the name of Tracey Lader, who you'll remember was a vital member of The Hope County Cougars - the baseball team turned Resistance faction - in Far Cry 5, has tried to recapture the good old days via a series of photographs. 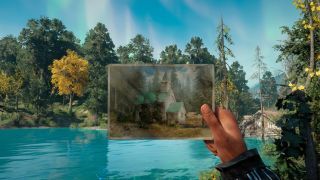 She obviously found some time to snap these iconic photos of Hope County in its heyday, and now it's up to you to figure out where these Far Cry New Dawn photographs were taken. There are nine Far Cry New Dawn Photographs to find in the game, scattered all over the map. But we've figured out where each one was taken, so you can just zip over there and take a look for yourself - and even earn yourself that lovely Before trophy on PS4, and achievement on Xbox One. Handily, once you've found the location for each of the Far Cry New Dawn photographs, it's just a case of standing near the small table with a camera perched atop it and aligning the original snapshot with the post-apocalyptic reality. You'll find the box of photographs needed to start this particular questline in the main building of Prosperity, your base. Go in through the front door, and head up the stairs to your right, and walk along the balcony there. There's a little exclamation mark prompt telling you there's something interesting there. You'll then add all nine of Tracey's photos to your inventory, which you'll need to line up with their real world locations. Here's where to find all the Far Cry New Dawn photograph locations, working northwards from Prosperity itself. Turns out the first of the Far Cry New Dawn photographs is actually taken of your new home - Prosperity. Go the the circular dip in the ground just to the west of Prosperity, and turn back on your home to realise that this new sanctuary is actually originally John Seed's Farm. Yes, the home of the youngest of the three Seed brothers is now your greatest concern, and full of life and hope once more. You'll find Tracey's table just to the south of the Aviation building, looking more at the house than the actual airfield itself. It's much more of a shambles now, but you can see the resemblance. If you follow the main road east from the Chop Shop outpost and then work your way through the shrubbery, you'll reach a clearing in full view of the strange propellor plane on top of a leaning tower supported by cabling. It's here you'll find Tracey's camera table, cataloguing what used to be the Fall's End Water Tower. Just to the north of The Refinery outpost you'll find a fork in the road where a small road comes off the main one. Tracey's table is nestled in here, just back from the road and gives you a clear shot of the Outpost and its three ethanol tanks. Originally a grain elevator, it's clear now that this place is a shell of its former self. The rats have been at it, and what used to produce food now is home to producing a new kind of fuel. There's a broken railway bridge on the main river that almost carves the map in half, where containers litter what's left of the structure that remains towering over the water. Head upstream from the bridge itself, on the western bank, and you'll see the table by the water. I had to stand in front of the table, basically on top of the camera icon on the yellow rug to get the photo positioned correctly. Head over to the Pantry Outpost, and walk across the main road just to the west. You'll see what remains of the little grocery store, with its big red apple sign as you make your way through. The table is just opposite. At least there's still flowers, eh? If you've added Sharky Boshaw to your arsenal of Far Cry New Dawn best guns for hire, you'll be familiar with the green hue of the water that surrounds this explosives plant. Go over the water to the west, and Tracey's table is up on a little ledge. Well, turns out that back in the good old pre-apocalypse days, it used to be the Mastodon Geothermal Park (complete with sulphur pools). Wait, what happened to the Mammoths this time? Head to the northeastern shore of the island where Joseph Seed's bunker is hidden, near the part that lies on its own like some kind of quotation mark. It's here, where the water has claimed some of the land and its buildings, that Joseph's Compound used to lie. Tracey's table is right on the water's edge, and although you can still make out what it used to be, Joseph won't be living here anymore. If you head on over to Joseph's Sanctuary, go back downstream but follow the eastern bank. Once you've got down a little, you'll spot Tracey's camera spot on the water itself on a little makeshift platform, looking back upstream towards the Sanctuary itself. It's in the mist here that the Dam lies, but it's what's beyond it that's really interesting now.